The Portuguese island of Madeira is located in the Atlantic Ocean, just north of the Canary Islands and west of the coast of Morocco. Often wrongly overlooked as a staid winter sun/cruise ship destination it offers fantastic opportunities for an active holiday; everything from watersports to hiking, mountain biking, canyoning and more. Those looking for a sandy beach to relax on should look elsewhere, the striking coastline is mainly made up of rocky cliffs - though there are some volcanic beaches dotted around the island. Temperatures are mild, staying between 14 and 25°C all year, making it a popular year-round destination for tourists. With its mouthwatering fresh seafood, meat dishes like espetada (skewered chunks of beef smeared in garlic and salt), locally grown tropical fruit and of course its famous fortified wine, Madeira is a gourmand’s paradise. A traditional Madeiran punch, made with aguardente de cana, honey, sugar, orange/lemon juice – it is more potent than it sounds! Its position in the Atlantic means that there are lots of opportunities for viewing these fascinating creatures. The laurel forests here have been designated a World Heritage Site by UNESCO. 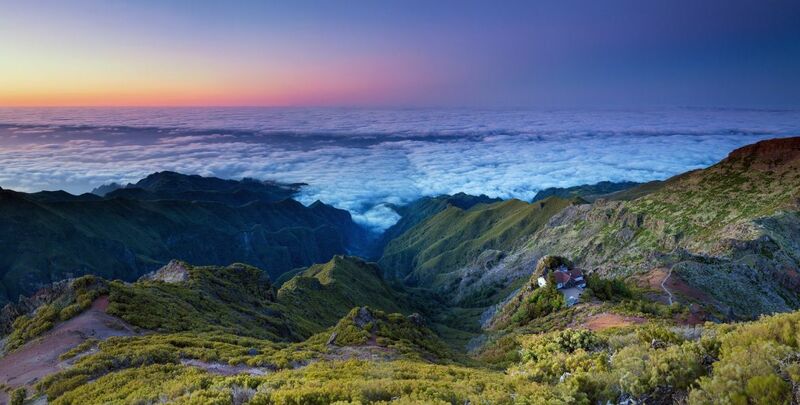 The Pico do Arieiero is Madeira's third highest peak at just over 1800m and offers fantastic views, you can look down on the clouds below. Follow the levadas, the irrigation canals unique to the island that offer numerous hiking opportunities and fantastic views. The capital city is a fun and lively place to visit. Take the cable car up to the Monte Palace tropical gardens where you can enjoy some great views, then take a Monte sledge down! These wicker toboggans have two drivers known as 'Carreiros' who steer you down the hill, great fun and worth a try. Madeira offers fantastic opportunities for canyoning, explore its numerous waterways by climbing, jumping rappelling and swimming. It is easy to get around by car or public transport, so you have no excuse not to experience the best this island has to offer! Take a look at some of our luxury holidays in Madeira for inspiration. There are direct flights from London Gatwick with TAP, Easyjet and British Airways. Any questions? contact us.